I have a google chromecast device which works well for my flat tv with hdmi input but then we wanted to utilize our old TV, you know those old big fat televisions of yesterday. Yes, we still have one of those. So how do you make your old TV smart? That was something I had to figure out and eventually did. 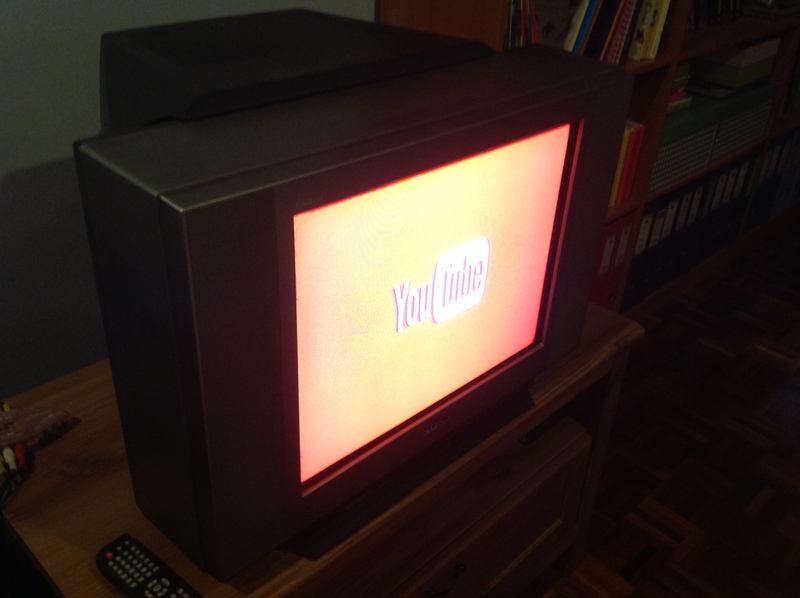 In this post, I will share with you step by step how to watch YouTube and other streaming video on your old TV. a red yellow white composite cable. If you have never used a Google Chromecast donger before, then please read my old post How To Use Google Chromecast To Watch Streaming Video From Google Chrome Browser before you proceed with the rest of this tutorial. 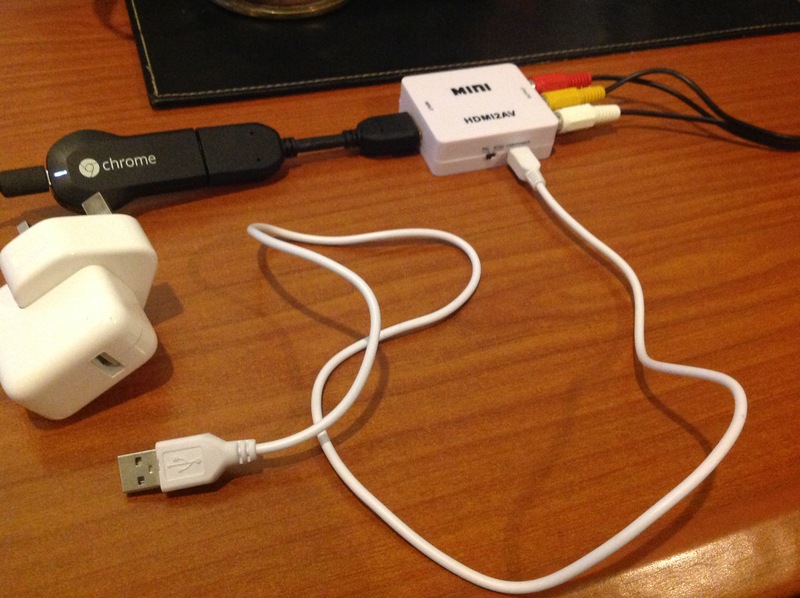 Step 1 – Power up your google chromecast dongle by putting the usb end into a usb charger plug and plug into an electrical outlet. If you have your desktop pc nearby, you can use the usb port from your desktop pc, then you won’t need the charger plug. 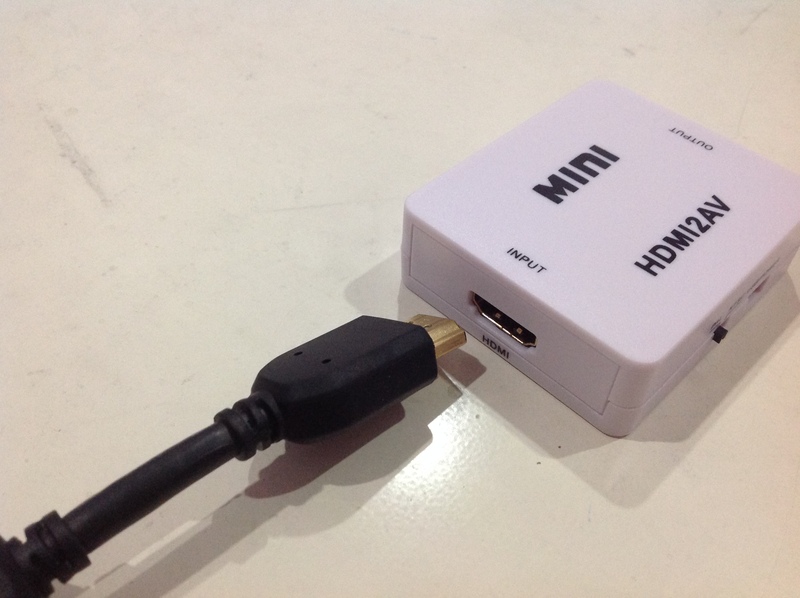 Step 2 – Insert the hdmi end of your google chromecast dongle into your hdmi to av converter. Step 4 – Insert the other end of your composite cable to the composite cable input of your old tv. This can usually be found at the back of your old tv. Just follow the color codes when you insert the wires. Red for red etc. 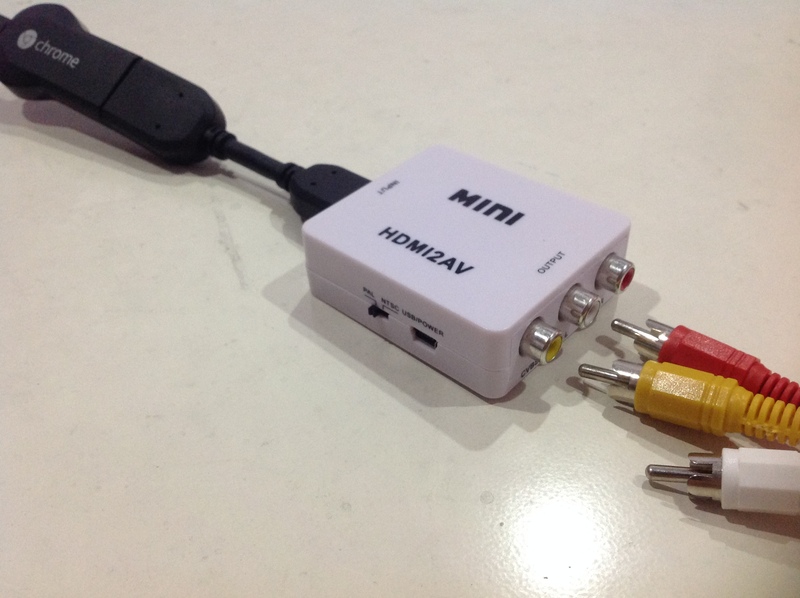 Step 5 – Power up your hdmi to av converter by inserting one end of the usb charger wire to the converter and another to a usb inlet nearby. Again, you can use the usb port from your pc or you can use the usb charger plug. 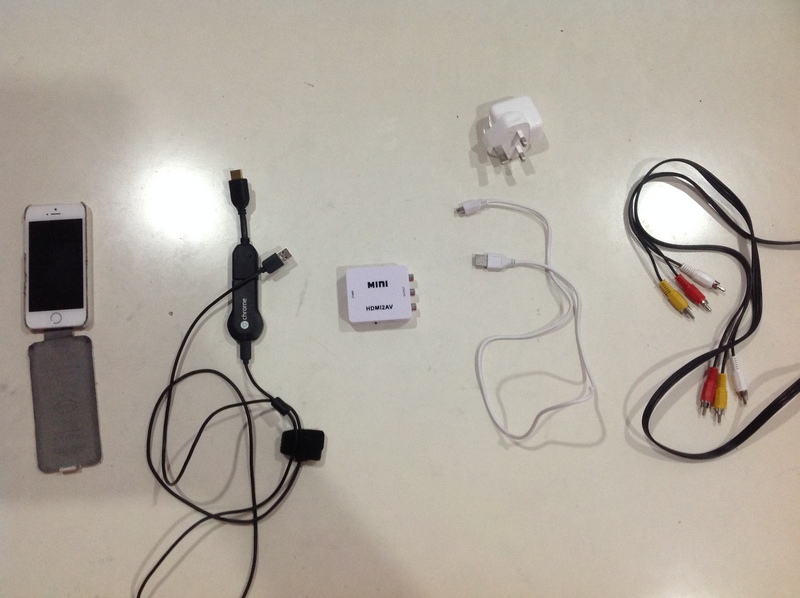 Step 7 – Select your chromecast. I named my Living Room. Step 8 – Tadaa! That’s it. 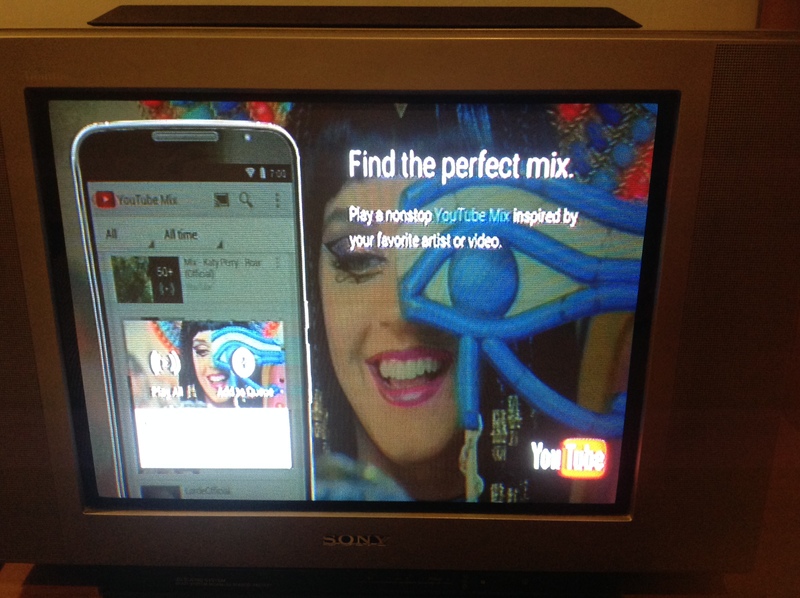 You can now watch YouTube from your old TV! Congratulations if you made it this far. 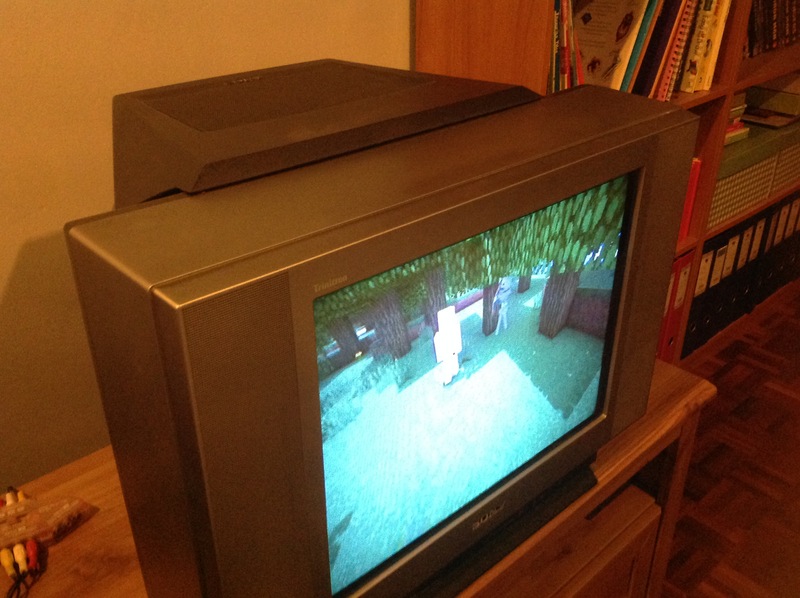 We’re watching a minecraft video on our old TV. Our old TV just became smart. Cool isn’t it? 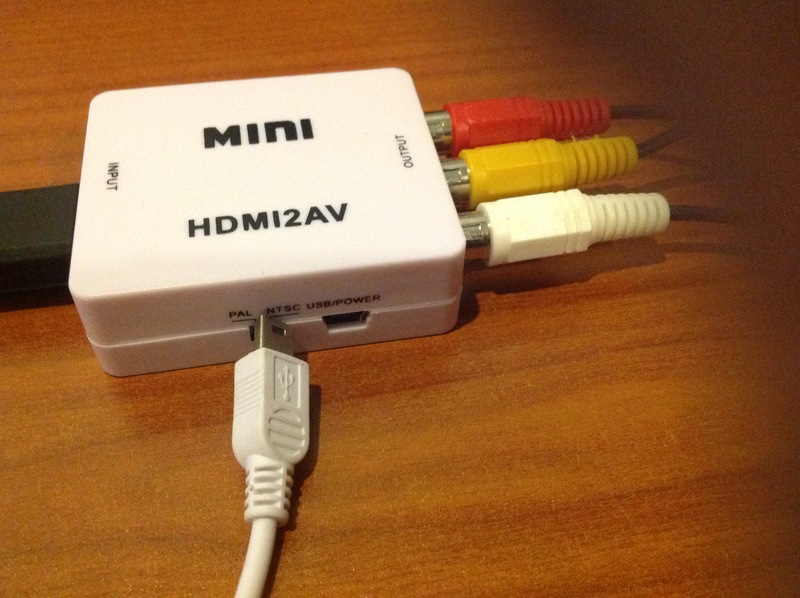 If you are using an old generation iphone or ipad ie those that use a 30 pin adapter instead of the lighting 8 pin adapter, then you can use the following to watch any streaming video from any website on your TV easily. 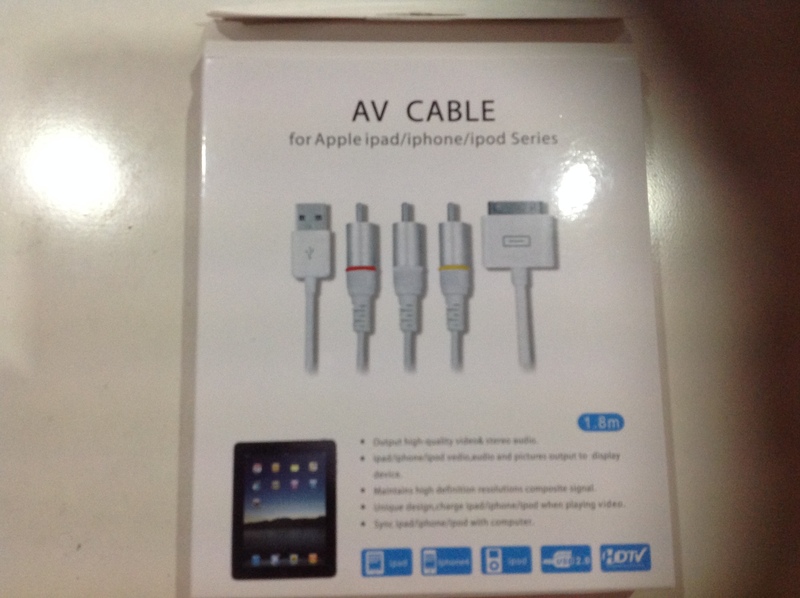 It is an AV Cable for iPad and iPhone. Remember, this only works for the older generation devices. 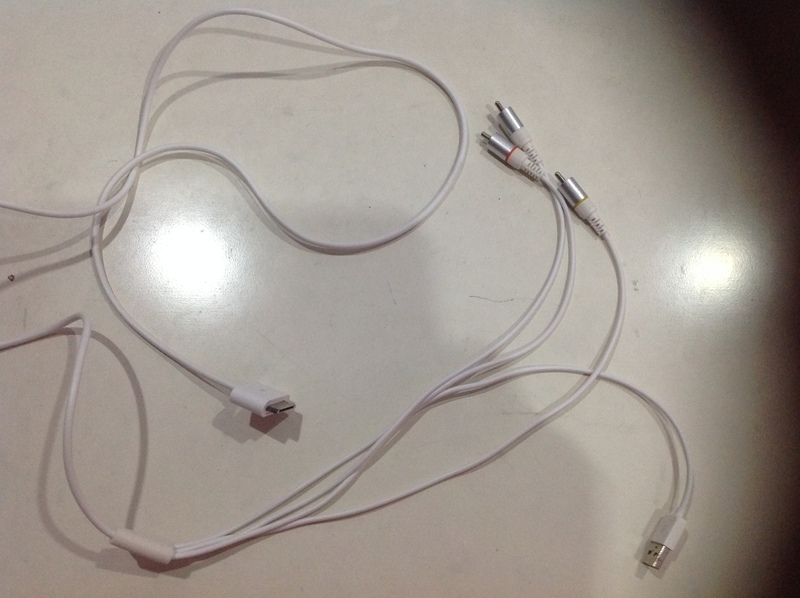 The AV Cable has 3 parts. Plug the 30 pin adapter to your old generation iphone or ipad, plug the usb part into a usb port to charge and power up the device and finally plug the composite cable into the red yellow white composite input of your old TV. That’s it! Here is the difference between the 30 pin and 8 pin adapter. The 30 pin one is larger in size. 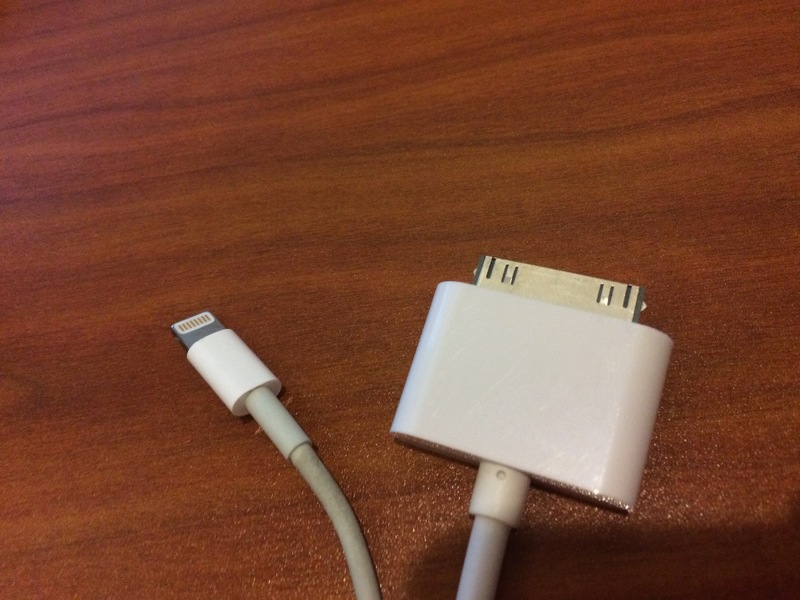 This is the part where you plug into your iphone or ipad when you need to charge it. So check whether you have a 30 pin adapter if you wish to use this option. I have an annual pass to Scribd for one year as an author of ebooks on Smashwords. My ebooks are listed on Scribd. Today I received an email from Scribd informing me that 10,000 comics and graphic novels have just been added to Scribd. Woohoo! 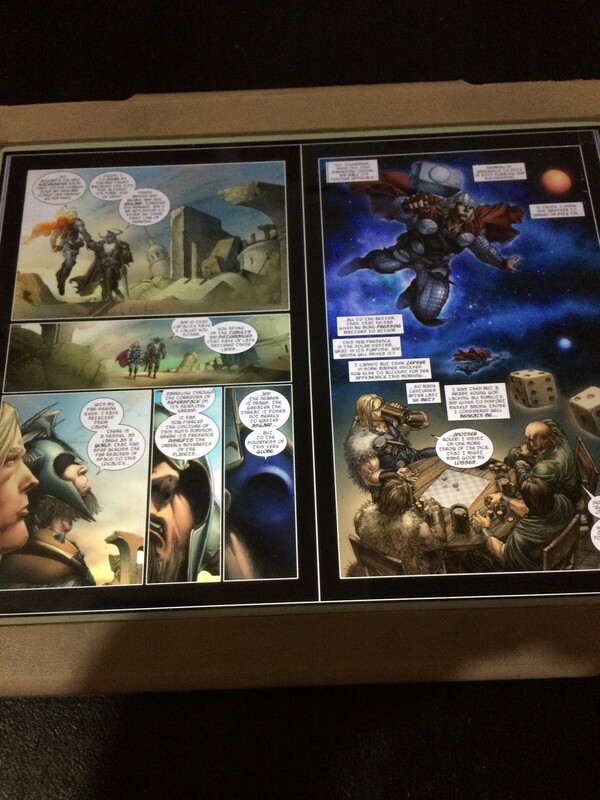 They include titles from Marvel, IDW/Top Shelf, Valiant and more. 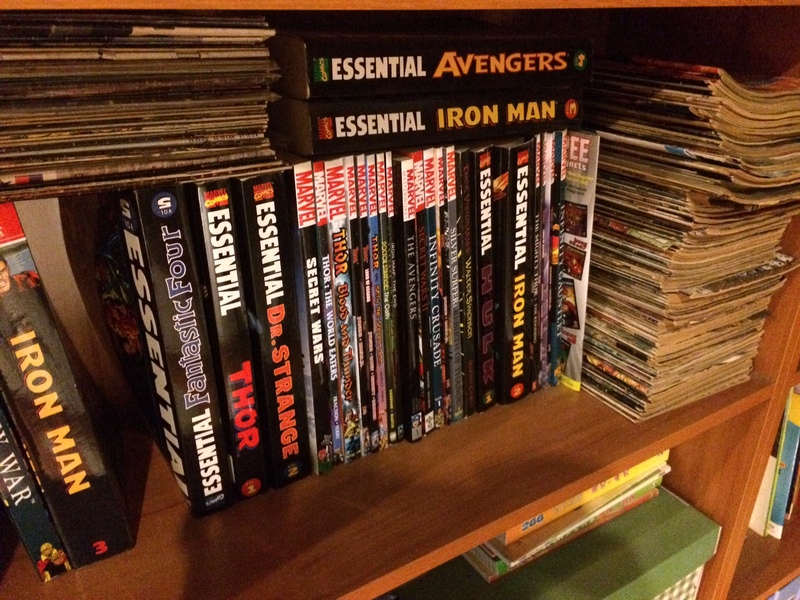 My husband is a Marvel fan especially Thor, Silver Surfer and Doctor Strange. I just downloaded my first copy of Thor on my device. It looks great. I love it. In addition, I’m going to be saving all this shelf space. I have no idea where to put all our comics as we keep on buying and loath to throw or give away because we re read them. I’m so in love with Scribd. I think it is really worth it. Anytime I feel like reading anything from romance or action novels to self help books, all I have to do is search the genre and most of the time I will find something I want to read. In fact, I’ve got so many books stored in my library, all half read. They include the many Minecraft books for my boy. When my free annual subscription expires, I will be back for more monthly subs. I’m hooked. My husband is a Star Trek fan. We have the Star Trek Original Motion Picture Collection and the Star Trek The Next Generation Motion Picture Collection in our DVD collection. He watches both these sets of DVD over and over again. So for his 50th birthday in early 2014, I have decided to include Star Trek The Complete Original Series DVD Seasons 1-3 in the gift basket I am doing for him. Since it is his 50th birthday, I am doing something special by making a gift basket on my own. The gift basket will contain all his favorite things, favorite movies, favorite comics, favorite scent, favorite family pictures which I did into a photo book and more. It is so much fun to do all this planning. I have already started collecting all these things to be put into his gift basket since early this month even though his birthday isn’t until February 2014. I think he will love the Star Trek The Complete Original Series DVD or Star Trek TOS the most. Although we watched them when they were playing on TV previously, it has been a long time since. He jokingly calls me “The Entertainment Officer” at home because I plan all of his entertainment needs. I know him very well and what he likes and Star Trek happens to be one of his favorite series. He will love to watch the Star Trek team boldly go where no man has gone before. To me the best gift for a Star Trek fan would be this original TV series that first introduced the original Star Trek Crew; Captain James T Kirk, Spock and Leonard McCoy and all the adventures of the USS Enterprise. How many episodes does the Star Trek TOS have? Here is a list of the Star Trek Original Series episodes with all the titles and the order in which they were broadcasted. The DVD is the remastered version. It is amazing to watch. Even though the original series first began screening in 1966, they don’t look outdated at all. Highly recommended for all Star Trek fans. This is where it all began. My favorite Star Trek Captain is Captain James T Kirk (1966-1969) followed by Captain Jean-Luc Picard (1987-1994) but that’s just my personal opinion. The other Star Trek Captains are Captain Benjamin Sisko (1993-1999), Captain Kathryn Janeway (1995-2001) and Captain Jonathan Archer. (2001-2005). That is why I recommend Star Trek The Original Series and Movies as a starter gift for the Star Trek fan followed by Star Trek The Next Generation Series and Movies collection and I did not include Star Trek Voyager Complete Series in my recommendations. Make sure you check the region code of the DVD when buying online. If you do not have a multi-region DVD player, you will not be able to play DVDs from other regions. This post isn’t a technical post about the how tos of blogging including SEO and all those technical jargon. Instead, it is a personal post written from the heart and from the experience of a blogger who has been blogging for 10 years. This was the first type of blog post I started writing. If you are writing a personal blog post, you can write things which are a little bit more personal. You can limit your readers to only those close to you if you like or just yourself. It depends on the individual. Some like to post lots of photographs which is really a nice thing if you don’t mind sharing. Readers love photos. However, I like my anonymity. Can you remain anonymous and still write a personal post? Yes, you can. I have been doing it for 10 years. I write posts that are personal yet not too revealing. It is okay to be personal without being too personal on your blog posts. You will still get your readers and followers if you remain true to yourself and keep your writing voice genuine. Instead of using personal photos, you can still include photos to make your posts interesting. Post photos of objects and scenes instead. I enjoy making crafts with my children. So I find writing how tos or instructional blog posts a natural progression from my personal yet not too personal blog posts. 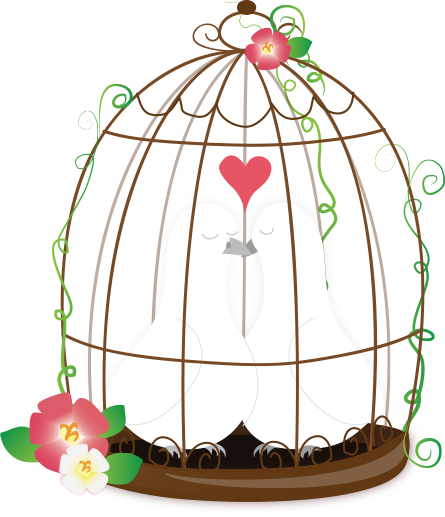 They are a nice way to record and keep our crafting moments in a digital format for keepsakes. When you write these types of blog posts, you must remember to include lots of photos and step by step instructions to make it easier for your readers. I have written many instructional blog posts like this and this. After blogging for some time, I started writing curations. Whenever I write a curated blog post, I always put myself in the shoes of the person searching for information. What is this person looking for and how can my blog post make a difference. Then I try to include everything that will help this person who is doing an online search find all the things that they want to know about that subject on a single page. This is the most important factor of all. You have to be an expert curator in order to write such a post so that your post makes a difference to that person instead of being a mere copy of a search engine. When writing this type of blog post, remember to include relevant links, videos, photos and always seek permission for use of photos. Here is an example of one of my top posts on my parenting blog. It is a curated post of Homemade Teacher’s Day Gift Ideas. Some of the ideas are my own while some others are from my FB friends. I sought the permission from all of them to post their ideas on this post. At one time, paid posts were very popular and many companies looked for bloggers to link to their products, services and websites. It is not so popular now but this is just another way of writing. Sometimes, you may write a paid or sponsored posts while at other times, you may write to sell, for example if you are an affiliate marketer. For example, I am a participant in the Amazon Associates Program. So from time to time, I do write posts to “sell”. This is an example of my review type or marketing oriented post: 10 Cute Dollhouses For Girls. In a way, this is a curation type of post too. Photos and descriptions are very important. However, do note that the behavior of someone who is searching the internet for information is different from someone who is searching the internet to buy something online. The person searching to buy something may be more interested in photos of the product and will not have time to read lengthy reviews so keep it short while providing the necessary information they need. Photos and videos are helpful. Just put yourself in the shoes of the person searching for information and think of what YOU would like to see and read in the blog post. That is the best SEO advice anyone can get. You don’t need to know what SEO is or how to do it if you just prefer to write. You will get your traffic just by putting yourself in the shoes of the person searching for information. Finally, you can write articles of any subject you feel you have the confidence t o share in. I like to write a lot of parenting articles that change over time. I used to write breastfeeding articles, now I write about kids education in grade school. You can write about your gardening projects or your pets, it is up to you or something more technical. I consider this post an article type of post. Articles MUST be genuine and not copied from somewhere else. Do not copy and paste or spin articles from somewhere else on the web. After writing your post, create a “cover” for your blog post, then pin your image to invite people to come to read it. Writing blog posts isn’t only about writing. Think of it as creating a magazine with a nice layout that calls out to the reader to read. 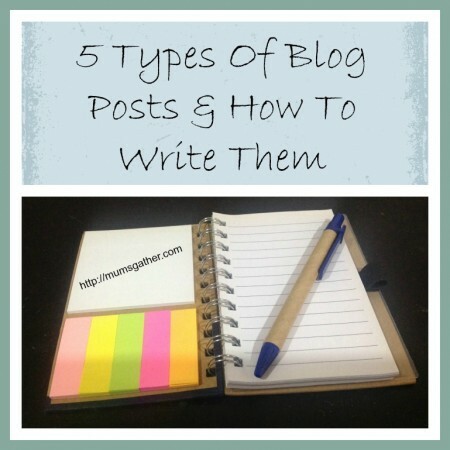 Share your blog posts on social media, FB, Google Plus, Twitter etc.